Dorset, UK maritime company Marine Components International has increased turnover by a quarter in the last 12 months under new management. New deals in the superyacht and motor boat sectors across the UK and Europe have ramped up turnover to $1.76million, nearly double sales from two years ago at the company which provides distribution and technical support for a range of manufacturers. 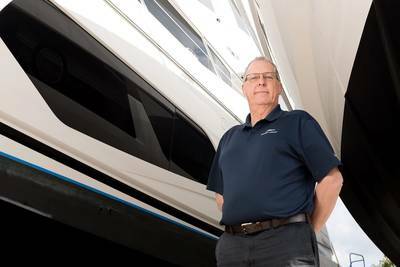 MCI managing director Andy Scott, who took over the Poole headquartered company in 2017, said growth is being driven by orders for its American-made Bennett trim trabs systems with customers including south coast luxury boat builders Princess Yachts and Sunseeker. Meanwhile, MCI is also seeing growing demand for its American manufactured Groco range of bronze valves and strainers with deals being struck with superyacht and boat building yards in Italy and Greece. Another area of growth is MCI’s Dr Shrink range of industrial packaging which is used to shrink wrap boats during refit and winter storage. Mr Scott said boat yards in the UK and Majorca have placed orders for MCI’s Dr Shrink products in the last year. In addition, he said Dr Shrink is seeing growth in the industrial sector protecting machinery during transportation and buildings under construction. Mr Scott said MCI has a clear strategy to win more work in the superyacht and leisure marine sectors working with boat yards and naval architects in the UK and Europe.